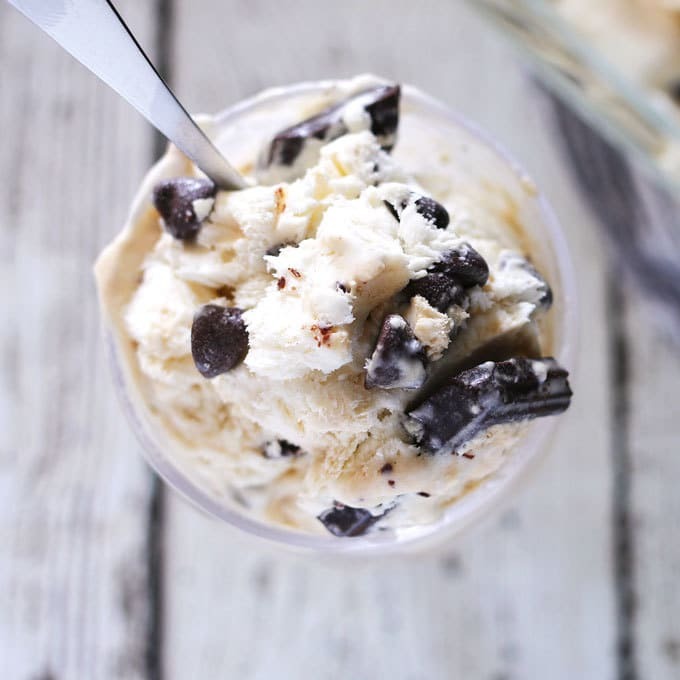 This no-churn coffee chocolate chunk ice cream is for coffee AND chocolate lovers. 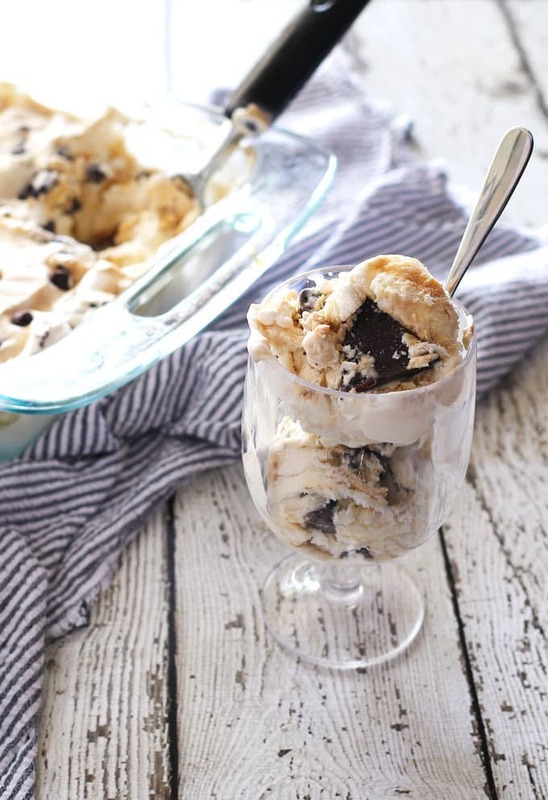 Coffee-infused sweetened condensed milk and a thick coffee syrup make this ice cream magical! 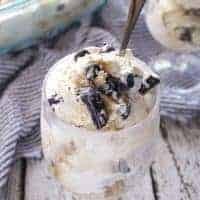 Also, join me for Ice Cream Week – check out all of the delicious ice cream recipes my blogger friends have created and join our Ice Cream Week giveaway! She asked if we wanted some ice cream and out came a carton of coffee ice cream. It was the first time I had tasted anything coffee-flavored – I don’t think I’d even had coffee yet because I was pretty young. It’s kind of funny, cause I think I hated it at first bite. The second bite was a little better. Before you knew it, the bowl was gone and I had a brain freeze situation going on. Years later, when I had my first real apartment, my roommate was a coffee junkee with an obsession for coffee-flavored ice cream. Thankfully, she was very giving and would always show up at the right time with a pint of coffee ice cream and two spoons. 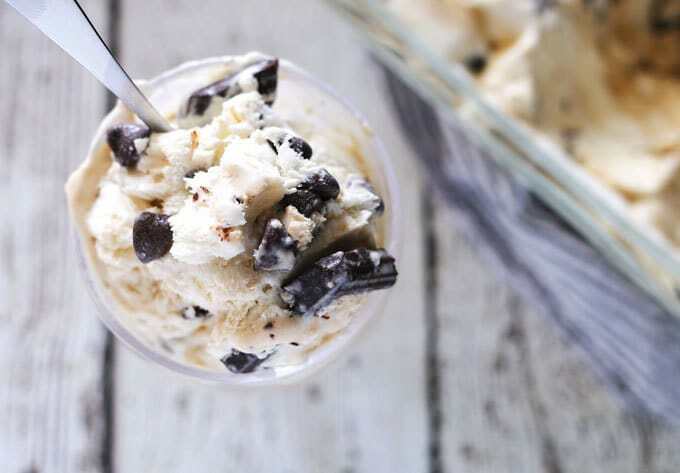 I decided to use my love for coffee flavored ice cream as the inspiration behind this no-churn coffee chocolate chunk ice cream. The coffee flavor comes from two spots – one, coffee-infused sweetened condensed milk and a really syrup-y coffee syrup I made. To infuse the milk, heat a can of sweetened condensed milk in a small pan. When it gets to the point where its about to bubble, remove it from the heat and pour in the coffee beans. Let that sit until it cools, stirring occassionally, and then strain out the beans. I strained my mixture twice because some coffee bean pieces didn’t want to leave the milk. To make the coffee syrup, I took one cup of hot strong brewed coffee and two cups of sugar and combined them in a small pan. I stirred the mixture until the sugar dissolved and let it simmer on low heat for 20 minutes. Then I put both the coffee-infused sweetened condensed milk and the coffee syrup into the fridge to chill. 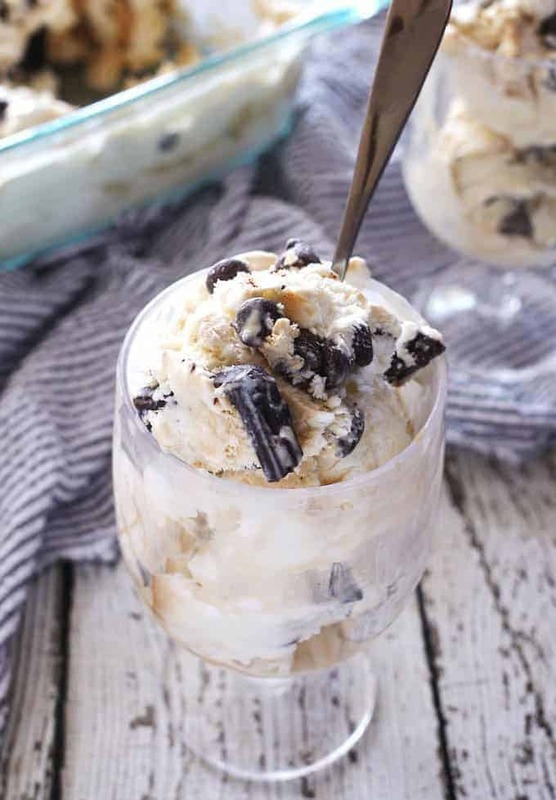 After that, it was all a matter of chopping up a chocolate bar and grabbing some chocolate chips before I used the Kitchn’s no-churn ice cream recipe again. Seriously, that recipe is magical. Pour the sweetened condensed milk into a small pan. Heat on low until just below boiling. Add the coffee beans and set aside to cool. Strain out the coffee beans (may take two strains to remove all coffee bean chunks.) Put in fridge to chill. In another small pan, combine the hot coffee and sugar and cook over medium-low heat. Stir until the sugar dissolves, then let simmer for 20 minutes. Allow syrup to cool, then put in fridge to chill. When the coffee-infused condensed milk has chilled, pour it into a medium bowl. In another bowl, whip the heavy cream until it holds stiff peaks (about 3 minutes). Mix a scoop of the whipped cream into the condensed milk and stir until combined. Pour the remaining whipped cream into the condensed milk mixture and fold the mixture until combined. Transfer half of the mixture into a freezer container. Sprinkle half of the chocolate chips and chocolate chunks on top. Drizzle 2-3 tablespoons of the coffee syrup on top of chocolate chunks. Repeat with the remaining ice cream mixture, chocolate and coffee syrup, pouring it on top of the first half. Drag a knife through the entire mixture to spread out the chocolate and coffee syrup. Press a piece of wax paper against the surface and freeze for at least six hours before eating. Mixture will keep for up to 2 weeks in the freezer. I love it when bloggers get together and get creative. There are some amazing recipes below and I urge you to look at them all, pin, comment, and make them all. 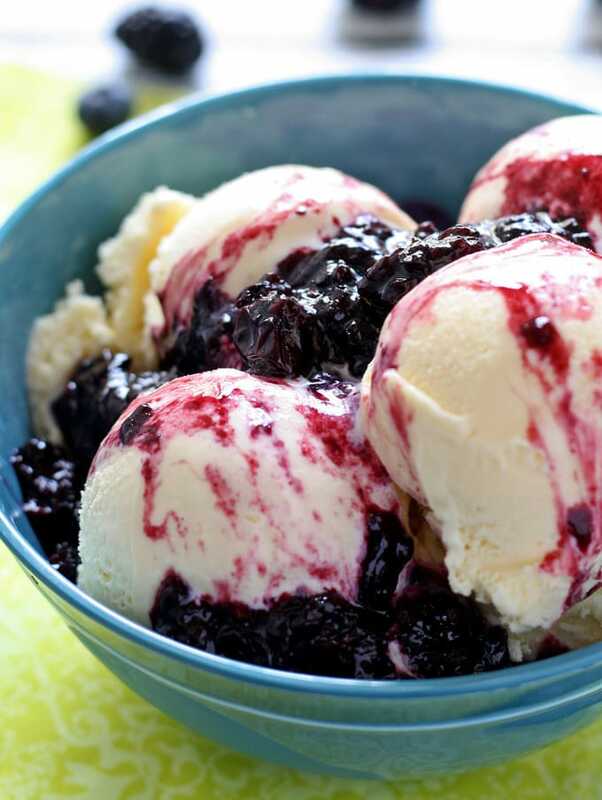 Berry Compote for Two – perfect for topping ice cream! Everything about this ice cream sounds perfect! I’d love a bowl right now! I love coffee flavored ice cream! I’d love a bowl right now! Goodness. This ice cream looks ridiculously wonderful! 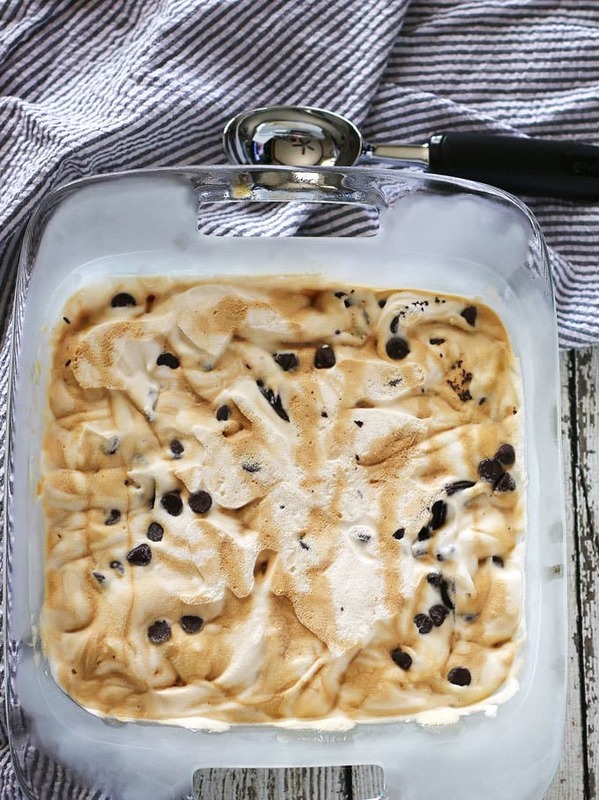 Like you, I tried coffee ice cream for the first time as a kid and was so-so about it. And while I hardly ever eat it these days, I kinda want to give it a go because coffee and chocolate together are divine. And it’s reaaaaaaally good in ice cream cake. And also wonderful on its own. So yes. Sign me up for a bowl! The texture of that ice cream looks great! I always make ice cream using an ice cream maker (love my Cuisinart!) but I really should try this simpler route for a change. gotta try no-churn ice cream! Wow! Love the infused milk for this ice cream! And of course I love the chocolate chunks that go perfectly with it 🙂 Very fun food memories you have – love it! 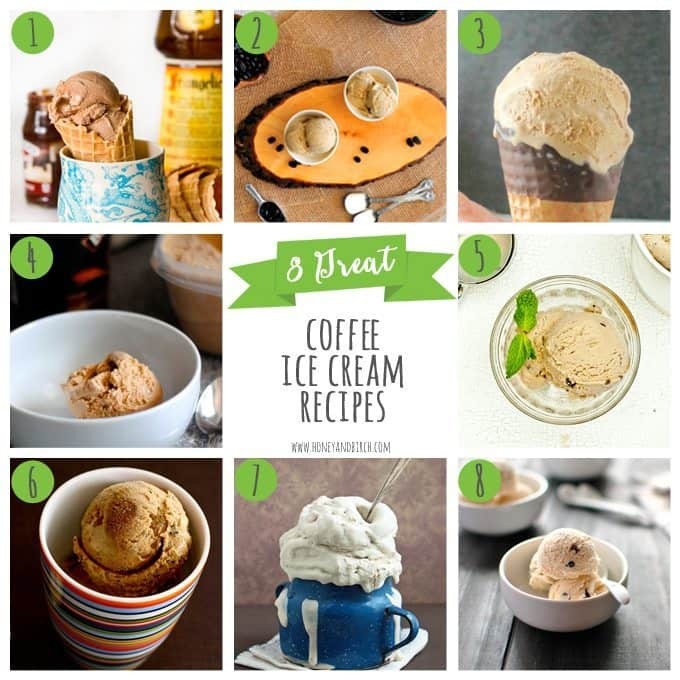 Love that you’ve infused the coffee into the ice cream in two ways. That way I’m sure it’s got plenty of great coffee flavor! So delicious with chocolate too! 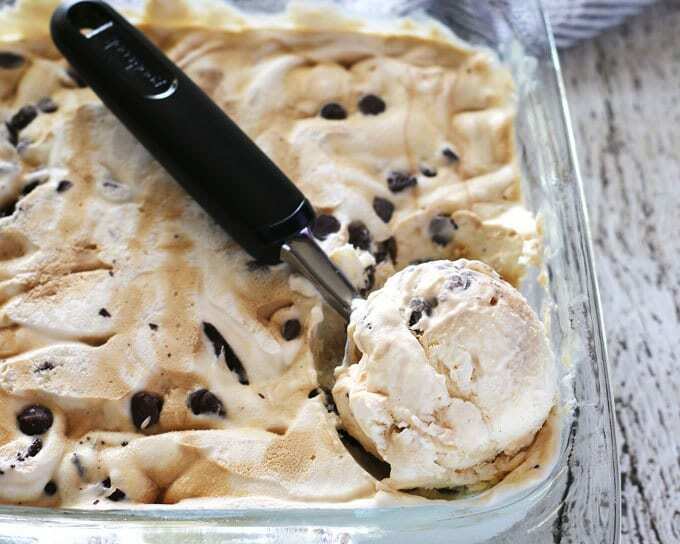 With two kids in the house, coffee ice cream usually gets voted down. But I love it and am now convinced that I should make a batch for just my husband and I to enjoy! This ice cream looks and sounds incredible. I would love a bowl right now! You had me at coffee! I can’t turn down coffee in any form. This ice cream looks like a winner! Yum! Coffee and ice cream? Yes, please!!! Pinning to try for sure. Thank you for sharing on Family Joy Blog Link-Up Party. Have a great week! When I was a kid we made ice cream with sweetened condensed milk and snow! Thanks for sharing on the What’s for Dinner link up! Yum! I love coffee ice cream! I saw your link @ what’s Cookin Wednesday -love it! Well, you seem to have written this one for me! Thank you for linking up to last week’s Tasty Tuesday linky. I have pinned your recipe the the Tasty Tuesday Pinterest board. I hope you’ll join us again this week! I have an ice-cream maker but now I wonder why I’d ever pull it out again!! These is gorgeous! Thanks much for bringing this by Throwback Thursday this week! !